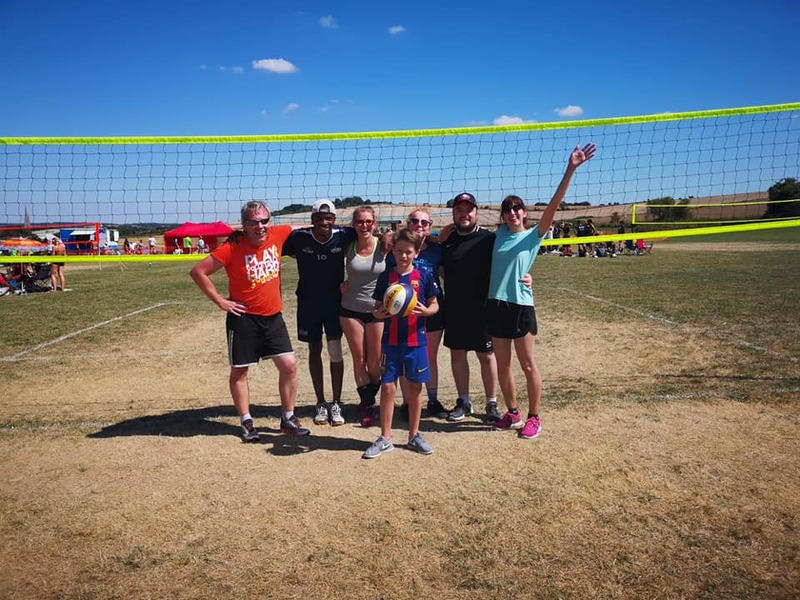 The baking hot summer continued for the Salisbury volleyball tournament at the start of August. We entered as Calne Voyager Ⅵ in the mixed category. Having struggled to get a team of six together, we did not get off to the best start when Alex had to pull out on the eve of the tournament. However Cliff had met two boys who had come down to play the pairs and were looking for a team to join in the six-a-side; therefore Jake joined our team while his friend Casper played for Wiltshire Mavericks, although Mavericks wanted Jake to play for them on Sunday. The rest of our team was Anji, David, both Harriets and Neil. There were nine teams in the Mixed 2 competition with each team playing all the other teams in 30 minute matches. We played six matches on Saturday. Although we only won the last of these, we had played well and came close to winning a few of the others. We did have a problem when Harriet Bentley hurt her ankle in the second match and had have treatment, although she did manage to return for the matches in the afternoon. The weather was very hot and sunny and we were glad to finish for the day. On the Sunday we played the final two matches of the round-robin and discovered that we had come eighth of nine. That meant we were going to play PVC Storm and Cry Me A River for the remainder of the day. We started well and beat both teams but Harriet Adams was not feeling well and could not continue. We were very grateful to both the other teams for lending us players to enable us to play the matches. For the final match Nik Ball joined us and played very well. The picture shows the Neil, Jay from PVC Storm, Lisa from PVC Storm, Harriet, David, Anji and Nik.